Civics360 is a resource for civics education that we at the Florida Joint Center for Citizenship are excited to provide to the civics education community in Florida and beyond. It contains readings in multiple languages, more than 60 animated and narrated videos across a variety of topic areas, practice assessments, external resource links, and vocabulary tools. Recently, we began adding short activity resources pulled from our traditional lesson plans that can be used as a supplemental enrichment or instructional tool within some modules (and this process is ongoing!). We constantly seek to improve this resource, based on your input and requests. Of course we are adding the aforementioned activities, as requested by so many folks. We are currently beginning work on improving the practice assessment, and we have plans to go back and re-record or revise some of the earlier videos to address concerns over pacing and related audio issues. One of the most requested additions is a transcript of each video. Happily, after an extensive review of every video and revisions to scripts that were changed during development, we have now completed and uploaded the scripts for all 60-plus videos on Civics360. These can be used as supplements to the video, to assist students in completing the viewing guides, to help kids that might be a bit hard of hearing, or simply as an additional reading resource if you don’t want to show the videos. You can find them right above the video itself. We hope you find these useful. If you have questions or comments about this or anything else on Civics360, please feel free to shoot us an email! It’s that time of year again, where we start preparing our kids for the upcoming Civics End of Course Assessment here in Florida. So here are some decent resources from across the internet that you might find useful. Of course, we must always keep in mind that any review should begin with making sure your kids are familiar with the Civics Test Item Specifications, because it tells you, and them, exactly what they need to know. But let’s start our review resource tour with the Florida Joint Center for Citizenship at the Lou Frey Institute‘s own pride and joy. You can sign up for Civics360 here. It’s always free, but registration IS required! 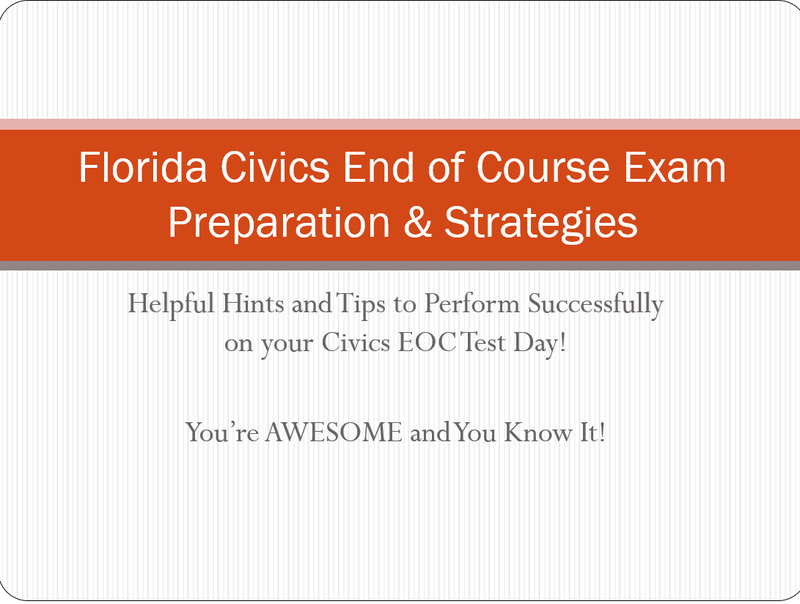 Here you will find a practice version of the Civics EOCA. This will give you some sense of what the assessment is like and how to use the different tools for an online version of the test, as well as what the questions are like. This is provided by the Florida Department of Public Instruction. 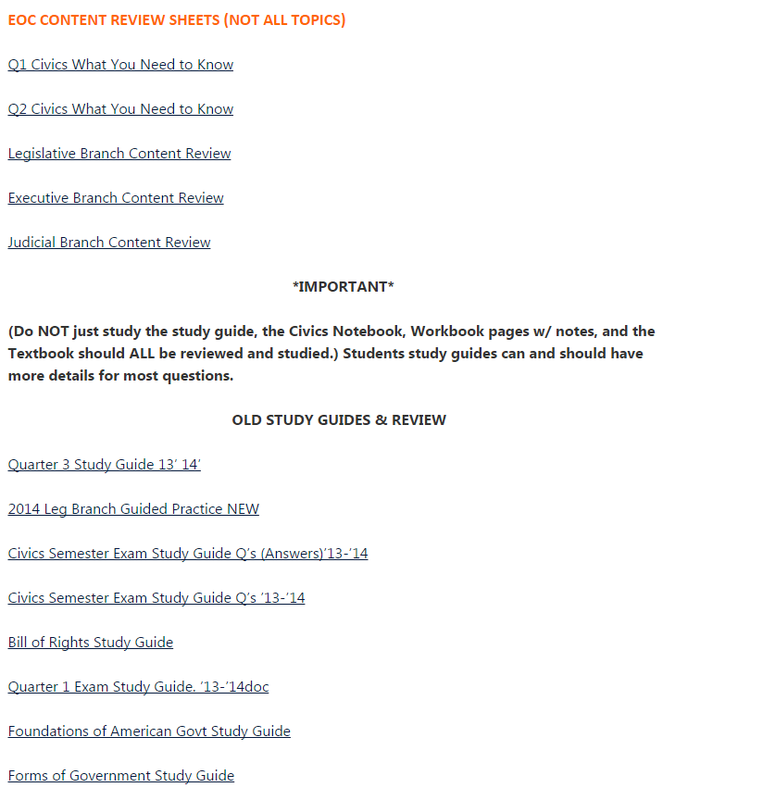 You will also want to check out the FLVS Civics EOC Practice test, which may be of use to you, though as with anything, you should decided how effective or appropriate it will be for your kids. Again, however, this shouldn’t be the first time that students are being exposed to these types and styles of items. Answers to the practice test items are available here. Note that answers are actually explained as well, which is an excellent element of review. I would suggest actually having students explain WRONG answers. If they can tell you why an answer is wrong, they should have a much easier time of figuring out why an answer might be right! We wrote about this review model before, and it may be one that you find useful as well. It worked well for Randall Middle School, and it is a positive way to mix things up a little for both you and your students. We explored this model in great detail in this post, and I encourage you to take a look and see if it is something you might like to do. Here is an EXCELLENT and short powerpoint covering strategies for the EOC. Thank you! Civics360 Videos Reach a Half-Million Views! You may have noticed a new logo, similiar to what is above this post, appearing on the FJCC homepage. That is a sign of some exciting news! The Florida Joint Center for Citizenship is excited to announce that our parent organization, the Lou Frey Institute, was recently welcomed as a member of the Civics Renewal Network! The Civics Renewal Network is a resource-sharing network made up of civics education organizations from across the country. The Florida Joint Center for Citizenship at the Lou Frey Institute is currently in the process of curating some of our quality resources to share on the CRN website, and we look forward to sharing and posting the resources of other civics education folks across all of our platforms! We are excited to be a member of this consortium, and look forward to sharing with you some of the quality work being done across the country! The benchmark pages on the Escambia Civics Review Site will be redirected to Civics360. This changeover will occur around the Thanksgiving break. This will impact your favorites and bookmarks if you have saved Escambia Civics Review Site benchmark pages in your browser. Other topic areas are partially complete, and we have about 13 benchmarks left to complete (for example, I am working on the video(s) for Benchmark SS.7.C.3.3 now!). We have also started compiling the scripts for hard of hearing students and are uploading them as we finish them. Once that all is complete, we will go back and tweak and modify and improve the resources we have. Thank you for all of your input and feedback on Civics360, and remember that you can direct questions to Dr. Steve Masyada, FJCC director. It is also important that everyone is aware that the benchmark pages on the Escambia Civics Review Site will be redirected to Civics360. This changeover will occur around the Thanksgiving break. This will impact your favorites and bookmarks if you have saved Escambia Civics Review Site benchmark pages in your browser. If you have not yet done so, I encourage you to make sure you register yourself, and have your students register, at Civics360. It is always free and it is easy. Thank you for your help and support for the Florida Joint Center for Citizenship! Join the Center for Legislative Archives to discover how to use political cartoons to teach about the United States Constitution. 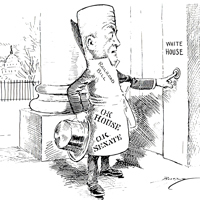 This webinar will draw from the collection of Clifford K. Berryman cartoons from the U.S. Senate Collection. Berryman’s career as a political cartoonist in Washington, DC, spanned five decades and his cartoons are a rich resource for history and civics lessons. During this interactive webinar, you will practice techniques for helping students evaluate visual content and explore ideas for how to use political cartoons to illustrate the “Big Ideas” of the Constitution, such as separation of powers and representative democracy. You will also explore additional resources from the National Archives for integrating political cartoons in the classroom, such as DocsTeach.org. This webinar is designed for middle school and high school educators. Register for the webinar here. Information about other upcoming webinars offered by our friends at the National Archives is available here! Check it out today. In 2015, Cherie Arnette (School District of Escambia County), Maureen Carter (School District of Palm Beach County), and Peggy Renihan (Florida Joint Center for Citizenship at the Lou Frey Institute) collaborated to create materials to support discussions around bystanders and upstanders. We here at the FJCC, and the wonderful people who developed these resources, believe that these instructional resources are useful for a variety of courses at varying grade levels. We urge you to review the materials and make your own decisions on age and course appropriateness. During the lesson, an incredibly rich and varied selection of primary source materials from the Holocaust and the Civil Rights Movement are used to examine social responsibility. Participants explore the reality that at different times we could all be upstanders, bystanders, collaborators, victims, and perpetrators depending on the situation. Well, it is another school year, and we here at the Florida Joint Center for Citizenship at the Lou Frey Institute wish teachers everywhere a great start to the year. In this post, you will find a compilation of the resources that we have to offer as you start the new year. If you have any questions about these resources, please feel free to shoot me an email! Civics360 is our newest resource, and we continue to add to it. Some of you may be familiar with the Escambia Civics Review Site; Civics360 replaces that site. So what does Civics360 bring to the table? We now have the Student Friendly Readings in three languages, and a reading guide in English that can help students with their understanding, crafted with the help of literacy experts from UCF. We have a collection of new videos, ranging between 5 and 10 minutes long or so, that break down the content into easy to understand visuals and text. We have also included video guides to aid in understanding. Please note that currently half of the benchmarks have videos; we are working hard to complete the remaining benchmarks! 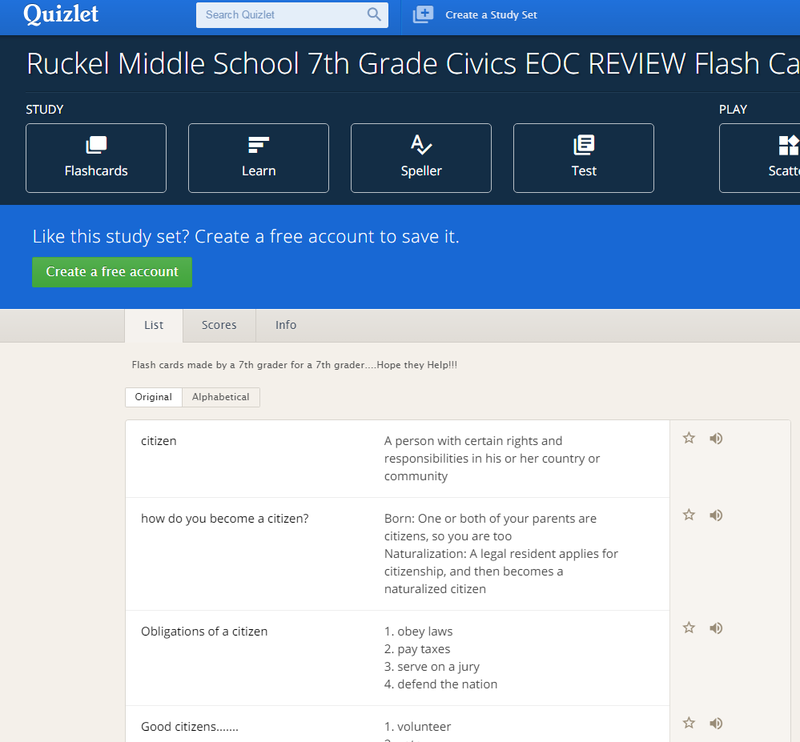 Additional new features include new vocabulary tools, digital quizzes, a brand new practice assessment that provides you with student reports, and more. Civics360 does require registration, but it is 100% free. Be sure to check it out! Our main website at Florida Citizen has a number of resources that you could find useful. Of course we have our traditional lesson plans for the middle school civics course. These lesson plans are all aligned to the benchmarks and benchmark clarifications, and include content elaboration for the teacher, relevant vocabulary, and a step by step walk through of instruction. We also have Students Investigating Primary Sources. This series of lessons for grades 2-12, developed in collaboration with the National Archives, provide students an opportunity to ‘play’ with primary sources around relevant topics aligned with Florida history, civics, and government benchmarks. You can learn more about the SIPS lessons here. We have not forgotten elementary teachers. Our Civics in a Snap lessons cover each of the K-5 elementary benchmarks, and take 15-20 minutes to work through. They are also aligned with relevant LAFS benchmarks. You can learn more about the Civics in a Snap lessons here. We have a number of additional resources available on Florida Citizen, including the first three parts of our ongoing webinar series. Be sure to visit Florida Citizen and register for access to the free resources today! Questions about any of our websites or resources can be directed to Dr. Steve Masyada at FJCC! Hope to hear from you soon!